Pam’s charm, warmth and passion for helping your audience look their best makes her the ideal speaker. Through her dynamic presentations, Pam shares with audiences the essential elements needed for successful dressing. Your audience will walk away with practical advice to help them look beautiful at any size – any age – any time! 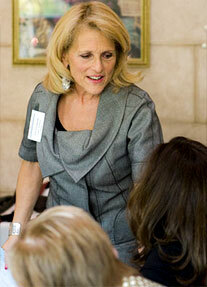 Pam is available for speaking engagements for corporations, associations, seminars and events. Contact Pam to inquire about speaking at your next event. Pam is available for Private Image Consultations, during which she’ll teach your employees the essential elements of successful dressing, and provide them with practical advice on how to achieve a confident, polished, and “put together” appearance. The ladies have been talking about last night’s event all morning! We have taken some of the tips we learned and applied them to our outfits today. We’re all little success stories! We knew it would be a great event, but it was a million times better than we imagined! What a wonderful program you produced for our Lunch & Learn series. I learned a great deal as did all of the participants. Thank you for your time, expertise and amazing work. I look forward to a great working relationship in partnering our expertise. This program was very good. This cannot be offered enough. She had great information and suggestions for all body types. I’d attend again! It was nice that Pam pulled people from the audience and demonstrated how we can “pop” our outfit just by simple accessories and a sweater jacket. Thank you for having the seminar.